EF082 folding knife full length : 7.6 inch .Wood pocket knife have liner lock. Blade material is 440C steel , the steel hardness is 58HRC and blade length :3.1 inch . Wood material and steel handle ,wood handle knife length :4.5 inch . Blade thickness: 0.28cm ,Easy to carry -perfect EDC outdoor knife tool . 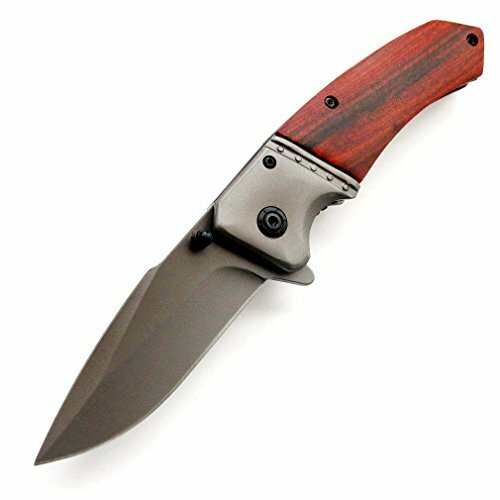 Folding tactical pocket knife weight: 142g , wood handle knife with clip . If you have any questions about this product by Eafengrow, contact us by completing and submitting the form below. If you are looking for a specif part number, please include it with your message.